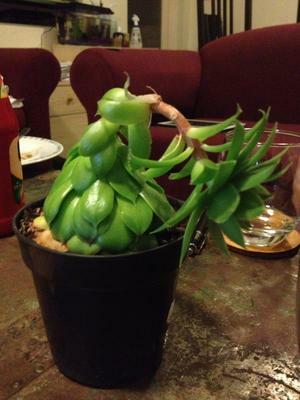 Was hoping you could help me out with this - someone bought it for me and had no idea what it was. 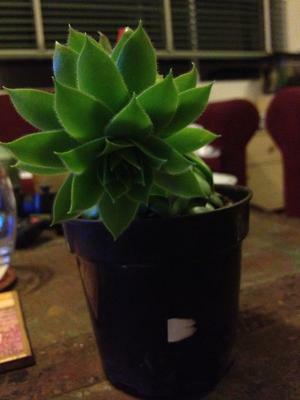 It looked very healthy when I first got it but after a few weeks it started to droop and look very sad! The base of the plant is about 6cm wide, rises up in a cone or bell shape and then a stem comes out with a big (5cm wide) green flower on top. It used to stick straight up but now bends over like an old man! The stem still feels quite sturdy though and the flower quite heavy. I've never seen anything quite like it - have you? Hi Luke - your 'flower' isn't a flower at all, that is part of the plant. This is some type of Sempervivum, or hens and chicks. If you're trying to grow it indoors, you'll be very disappointed, because these hardy plants require intense light, and dry conditions. If possible, I suggest putting it outside so it can get more light. Unfortunately, this one might not be salvageable, but here's what I suggest. Cut the top of the rosette off, and set it on top of some dry soil. With luck, it will root and grow to make a better looking plant. Get it outside, and hopefully, the base part that is left will produce some chicks that will be happy outdoors in a container or your garden. Find more information on this page: how to grow Sempervivum.